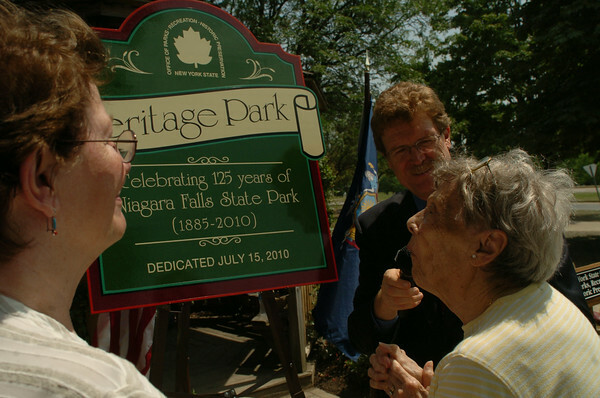 DAN CAPPELLAZZO/STAFF PHOTOGRAPHERNiagara Falls - State Parks Commissioner Carol Ash and Mark Thomas, regional state parks director, show Dorothy Welch Irvine, center, great grand niece of Thomas V. Welch, the first superintendent of the state park the new plaque which at Niagara’s newest park; Heritage Park, across from the Red Coach Inn. The dedication is part of the 125th anniversary of the Niagara Falls State Park. It is the oldest park in the United Stated.